It’s fascinating to go back in time and see what was in style then and just how far we’ve come. Itching for a bit of time travel, we decided to do some digging. 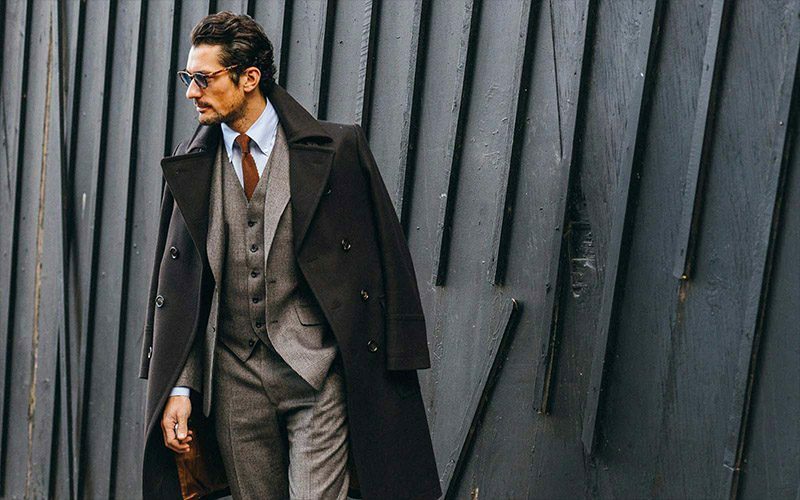 From tailcoats to zoot suits to bell bottom pants and everything in between, here is a brief timeline of the last 100 plus years of men’s fashion. 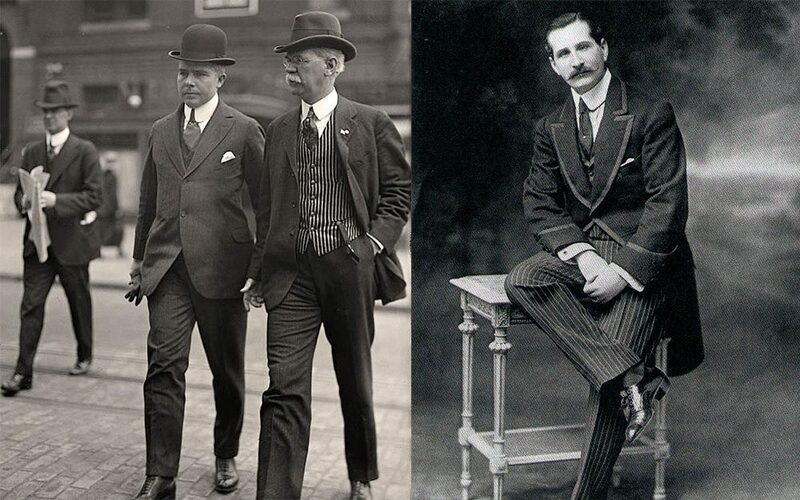 At the turn of the century, many began wearing the “middle-class men’s suit” that originated in England, as opposed to the more decadent knee-length frock coats and elaborate suits of the 1800s. Most suits in the early 1900s consisted of three pieces: the jacket, the trousers, and the vest (known as a waistcoat at the time). Men wore morning coats during the day, which are just jackets with a curved assymmetrical tailcoat from front to back. 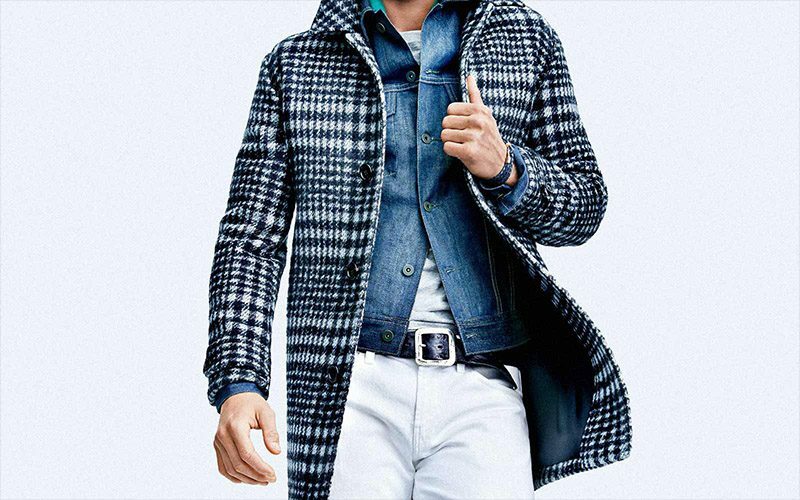 These coats were often paired them with matching or subtly striped trousers. 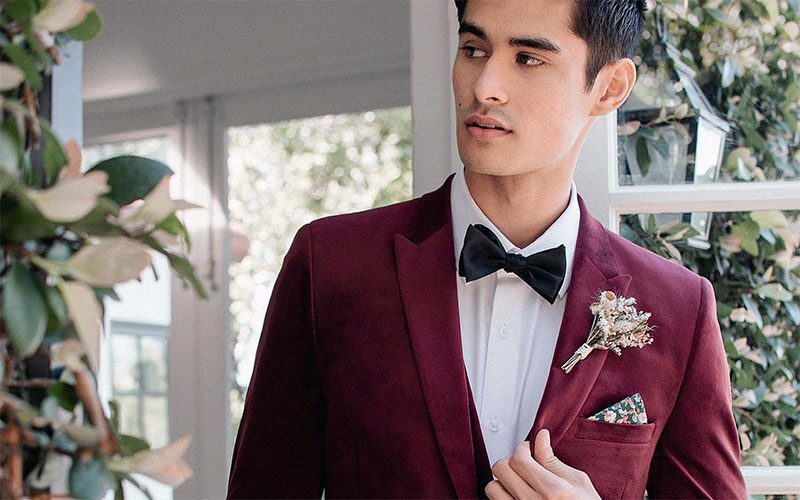 Additionally, men had evening suits in darker colors and richer fabrics. Like women, affluent men of this era would change clothes several times a day as propriety dictated. 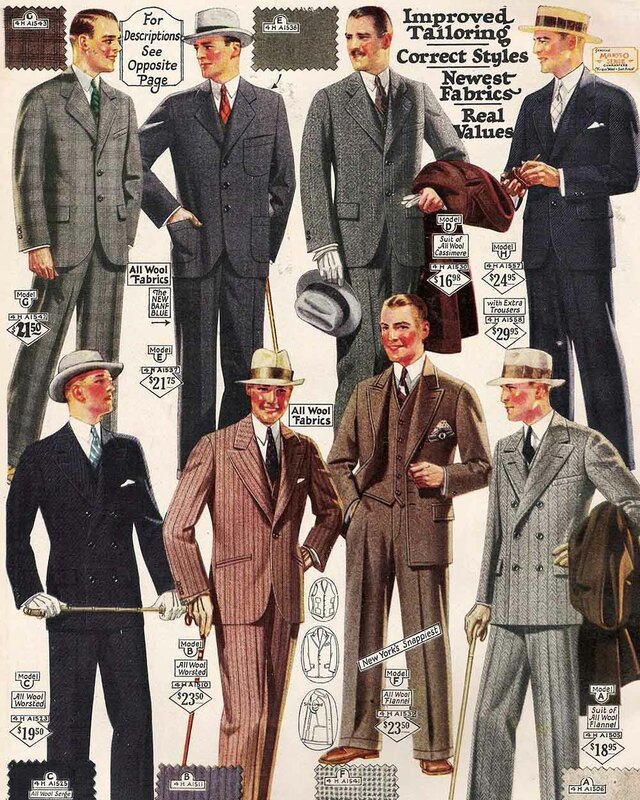 In the 1910s, lighter fabrics and simpler suits grew in popularity. By the latter half of the 1910s, a man’s daytime suit consisted of a straightforward single-breasted jacket with narrow lapels and high buttons. This was paired with straight trousers. 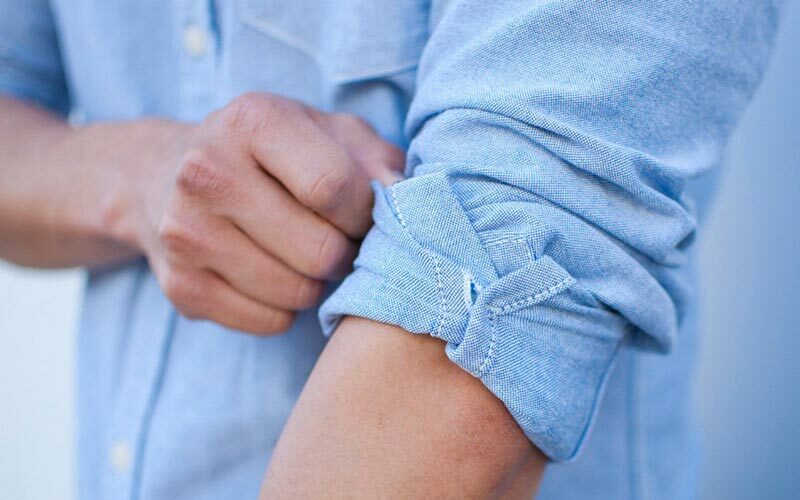 Button-down shirts were typically pastel, striped, and adorned with a club (round-edge) collar and a tie. 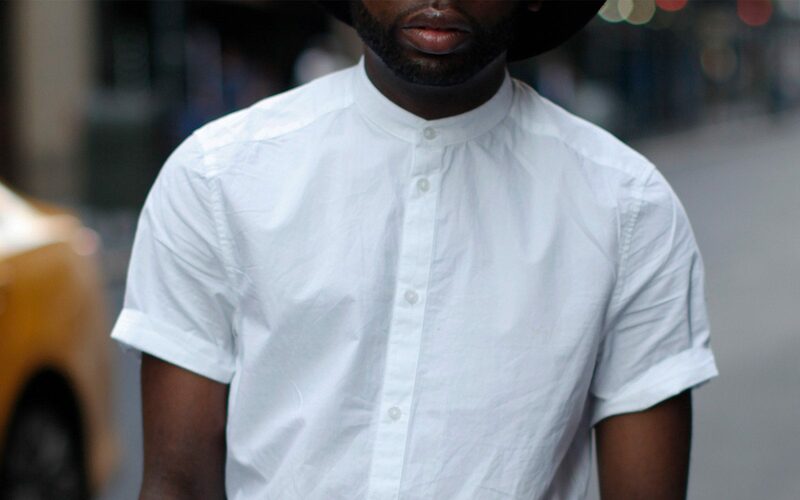 Collars, it should be noted, were detachable. 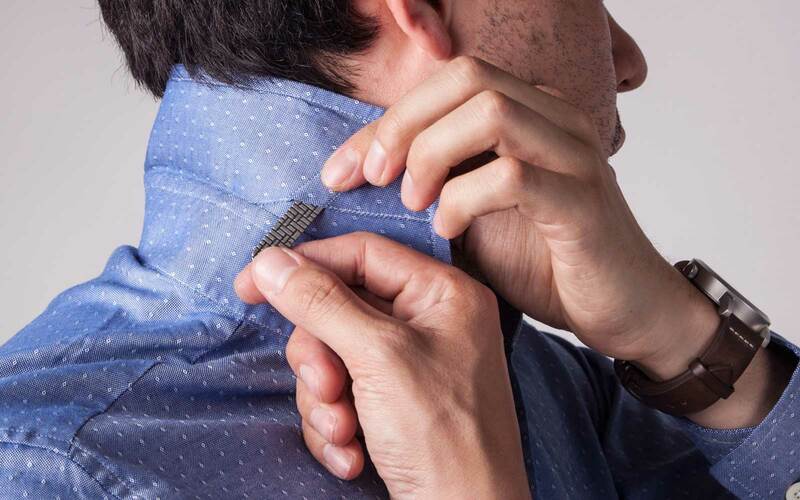 This was because collars required more frequent cleaning than shirts and could be more easily replaced if ruined. Men’s ensembles were topped off with boater or gambler hats, as well as two-tone boots. 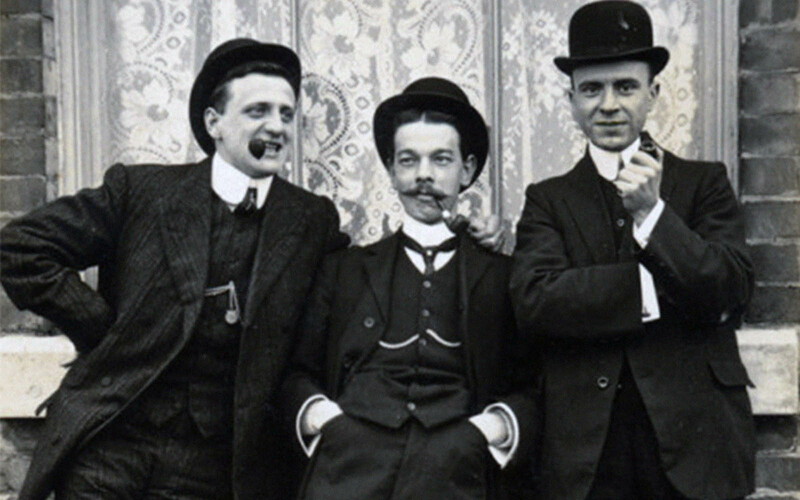 The gist: Men’s fashion was dictated by propriety and formality. The Jazz Age called for a new take on life, as postwar optimism was reflected in everything from clothing to music. Suits were simpler and slimmer, and brighter. 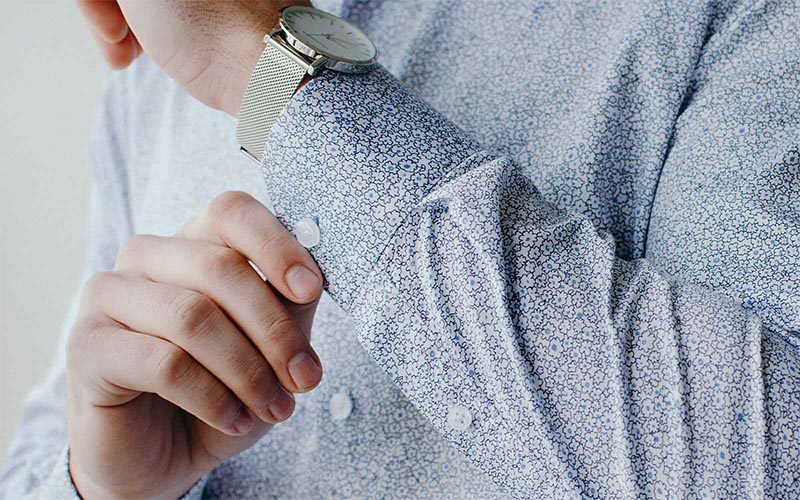 By the mid-’20s, button-down shirts with detachable collars and softer fabrics became the norm. The white striped shirts of the previous decade were replaced with an explosion of color. 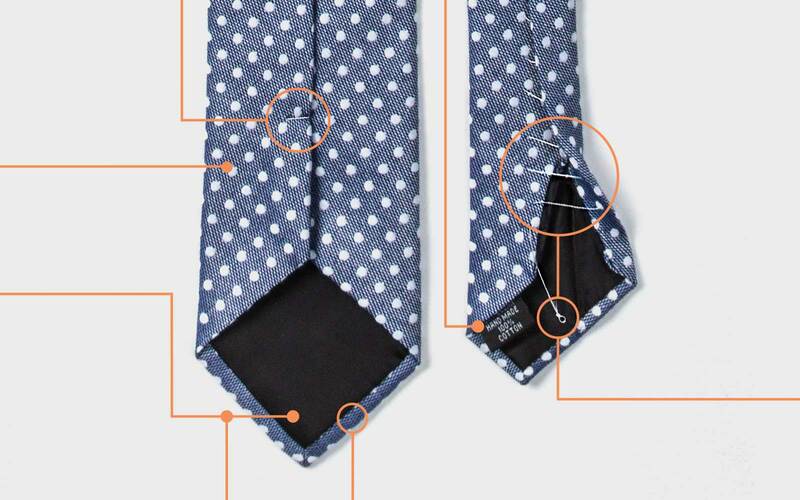 Men began tying Windsor knots with their ties, which meant that club collars were replaced with pointed spread collars to accommodate the style. It was a time of excitement, economic growth, and the birth of Hollywood. 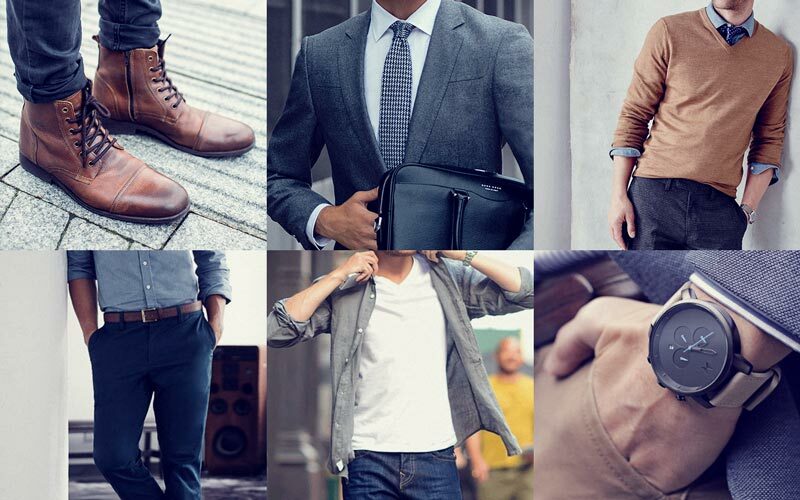 Every man dressed to the nines. Front creases and cuffs started popping up on trousers, adding bulk and casting a strong, stern silhouette. 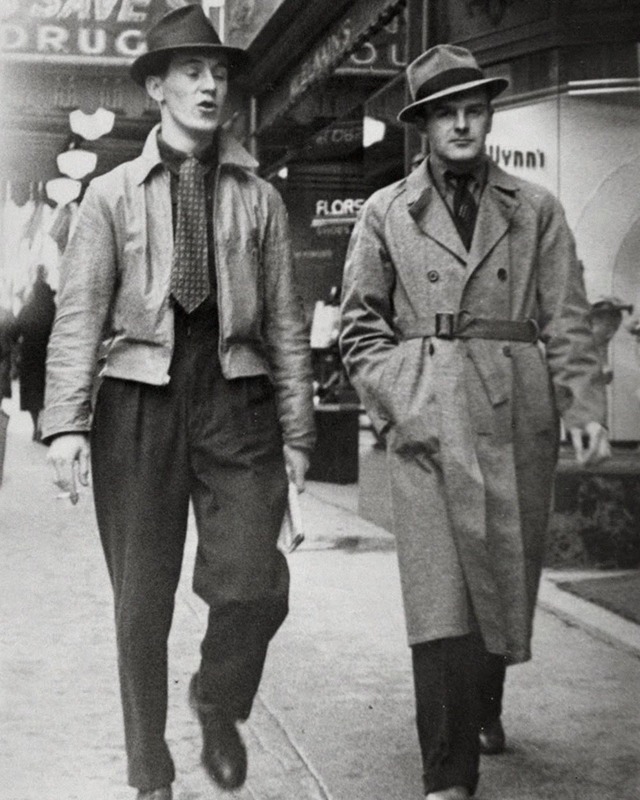 New, lower-sitting, baggy trousers meant that men began wearing belts instead of suspenders. 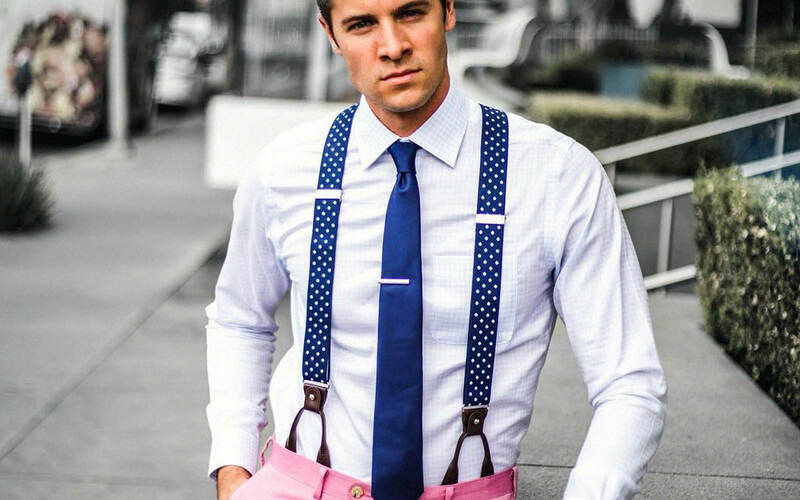 These new trousers, called “Oxford Bags,” originated at Oxford University. Collegiate sports style was on trend, and pants became quite wide in comparison to the tightly-fitted jackets of the era. Finally, if you were anyone in the ’20s, you wouldn’t be caught dead leaving the house without a befitting hat. 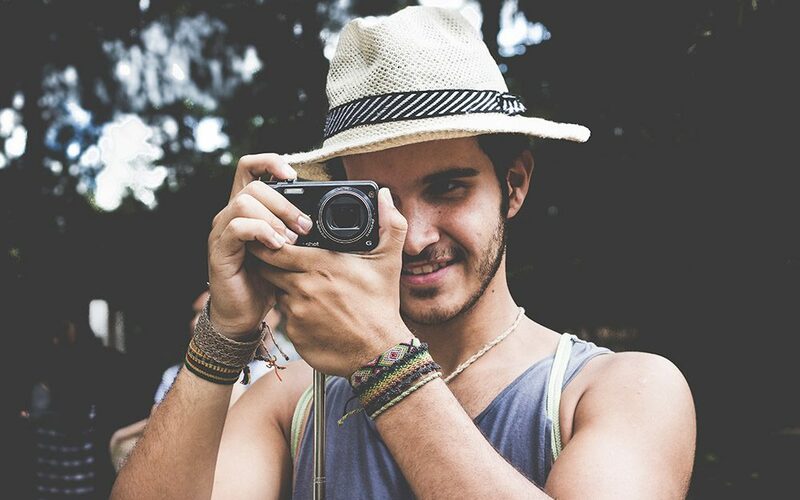 The summer months called for Panama straw and boater hats, while colder months required felt fedoras. As automobiles became more affordable, cars evolved into a major part of 1920s culture. This resulted in the popularity of driving-specific attire to come about, such as flat driving caps made of tweed or wool, leather jackets, and white silk scarves. On October 24, 1929, the economic world came crashing down, taking the fashion industry (and most industries) down with it. 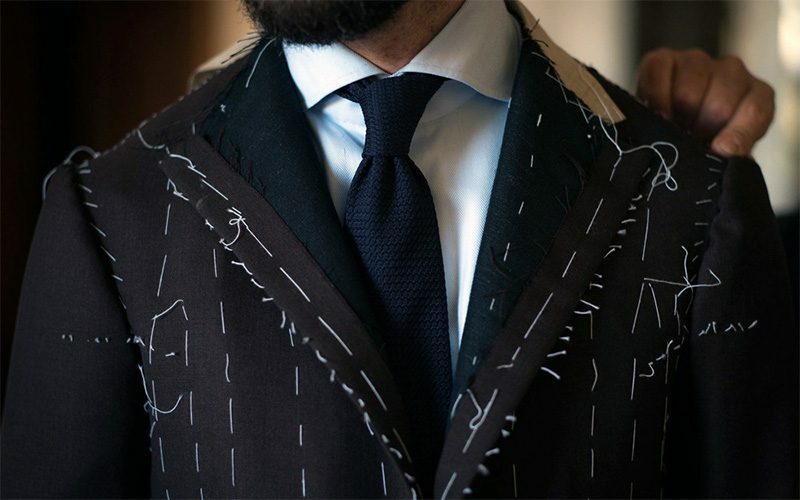 Cutbacks in clothing production and fabric rationing resulted in the restructuring of men’s suits in an attempt to maintain style despite cutting back costs. The “Superman” silhouette became popular: men’s suits were fashioned to illuminate extra broad shoulders (with shoulder pads), thin waists, and tapered legs. Suit jackets had very wide, pointed, elongated lapels to further emphasize a man’s broad shape. 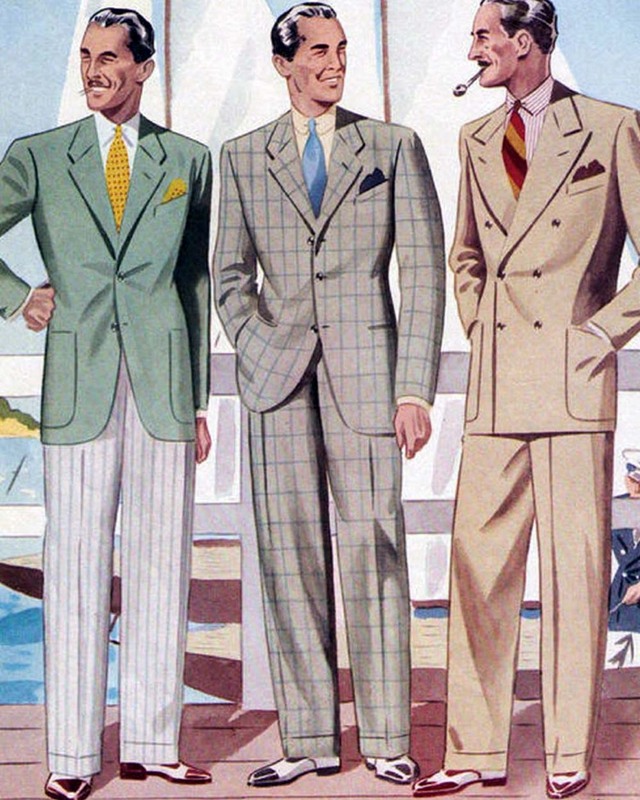 Men’s suits had thin waists in order to conserve fabric, and fashions of the time were predominantly teeming with dark and neutral colors, as bright colors were viewed as distasteful due to the hard times everyone was facing. Wool, flannel, tweed, and linen ruled the era. 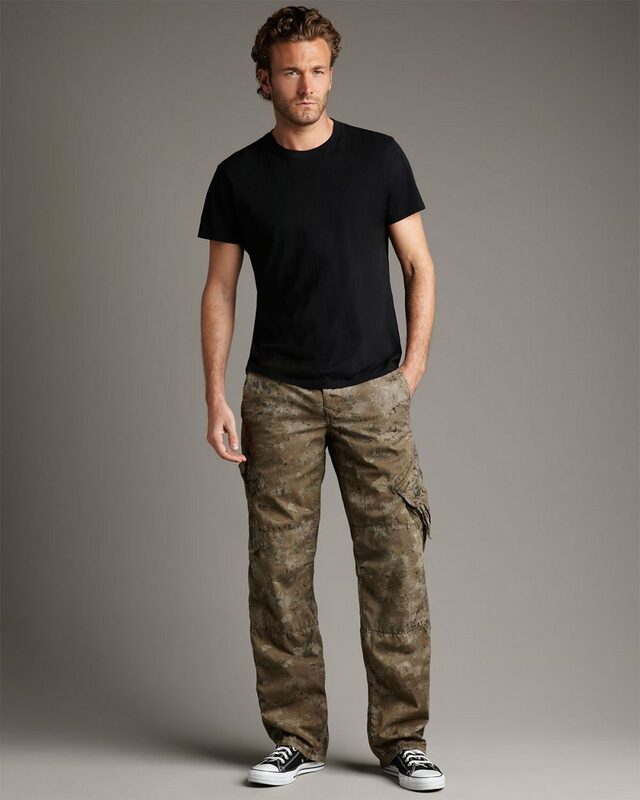 Men’s trousers sat exceptionally high up–about 3 inches above the naval–and hung down in long, straight columns. They were adorned with strong, pressed pleats running down the center. The polo shirt and the bush shirt (a short-sleeve shirt with 4 front pockets) became a popular alternative to the classic button-down. 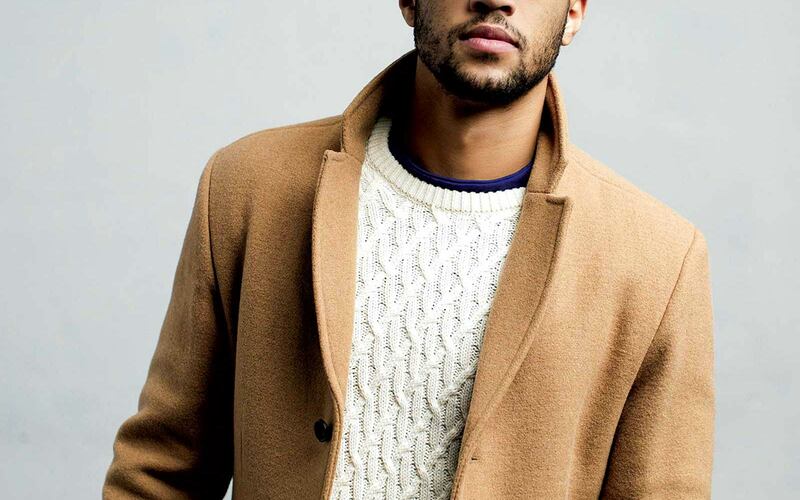 Younger generations began adopting sweaters from the lower class and redefining them as refined fashion garments. In terms of accessories, newsboy caps and Ivy caps took center stage in the ’30s. 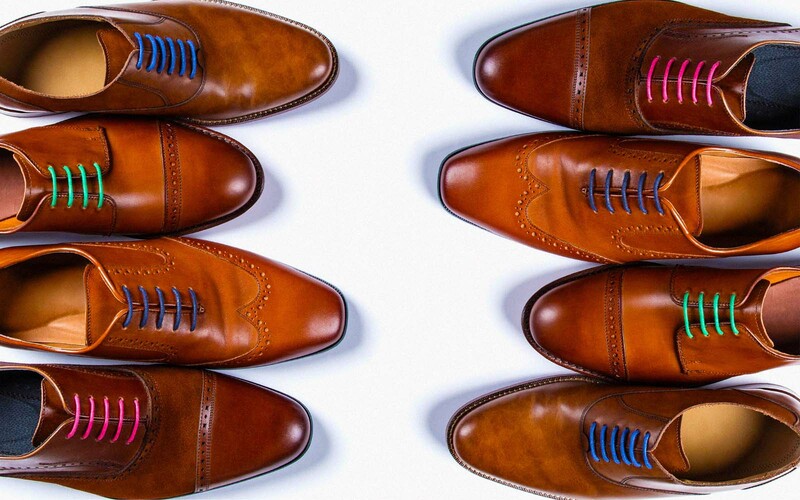 Oxfords (solid and two-tone) and wingtips were still popular shoe choices. 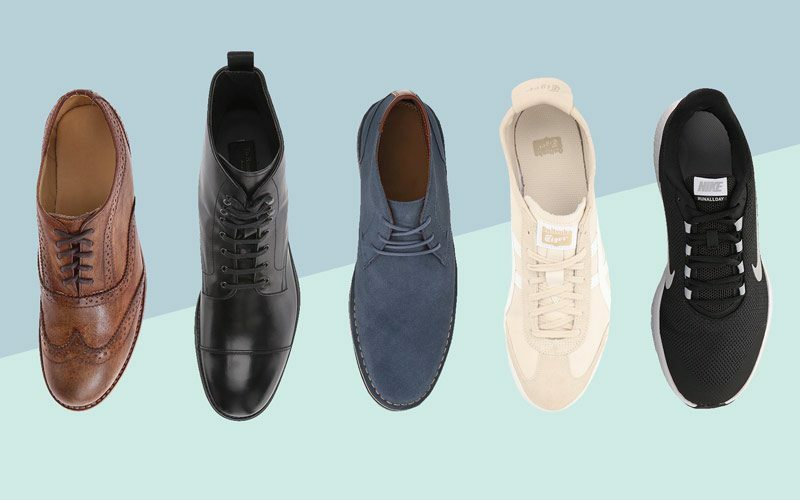 However, the birth of more casual shoe styles like moccasins, loafers, and rubber-soled Keds originated in the ’30s, and men would wear these at home or at sporting events exclusively. 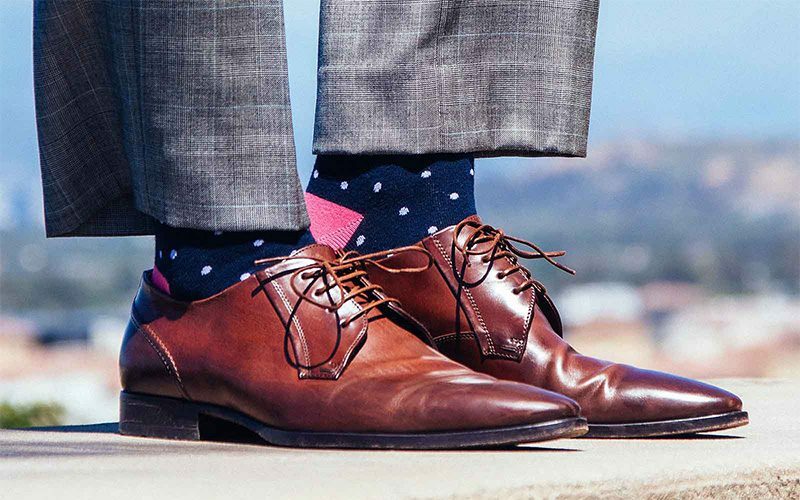 Bright checked and striped socks emerged as a trendy add-on to one’s business attire. The end of the ’30s gave way to the “Swing” era. Swing music, the jitterbug, and swing dancing hit the scene, and the zoot suit was born. 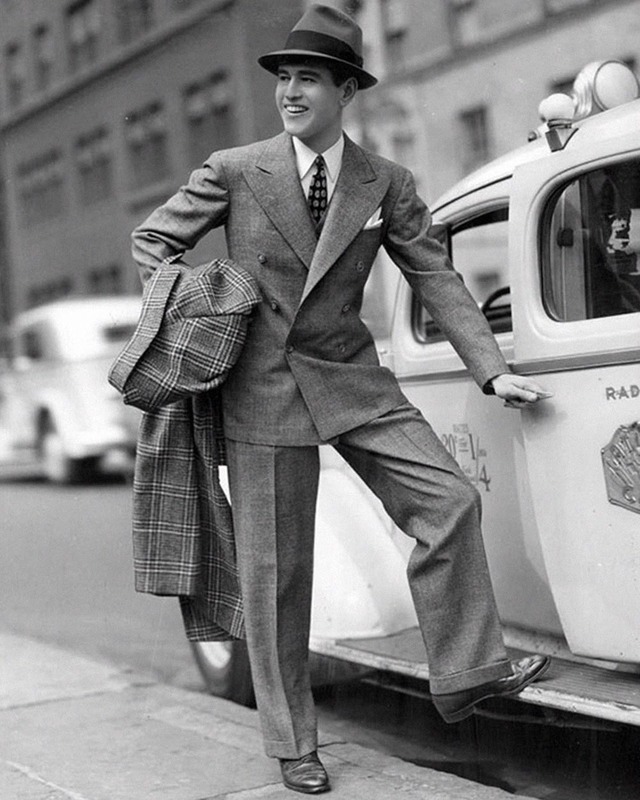 Zoot suits were characterized by excessive fabric and sleeves with pants worn tight at the waist. 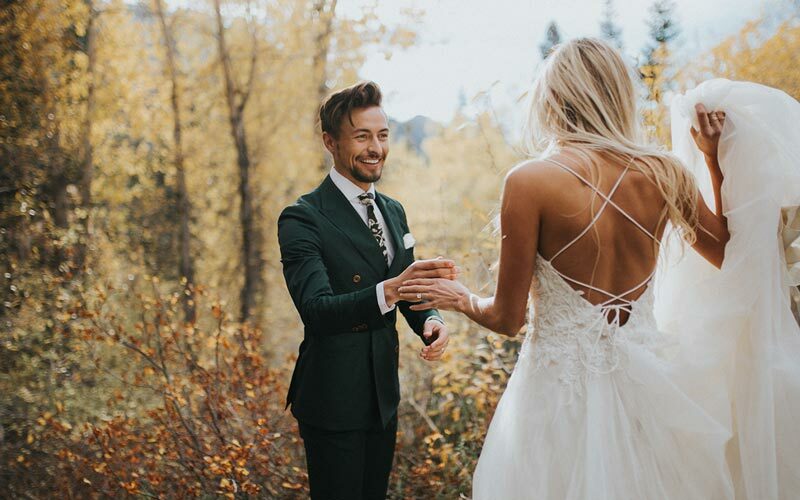 Jackets were long, and the suit came with a keychain accessory that extended to the knees, as well as a hat traditionally adorned with a feather. Zoot suits were thought to be both sharp and rebellious–as they were originally popular with gangsters and younger generations. The gist: The Great Depression caused fabric rationing and cutbacks in clothing production. 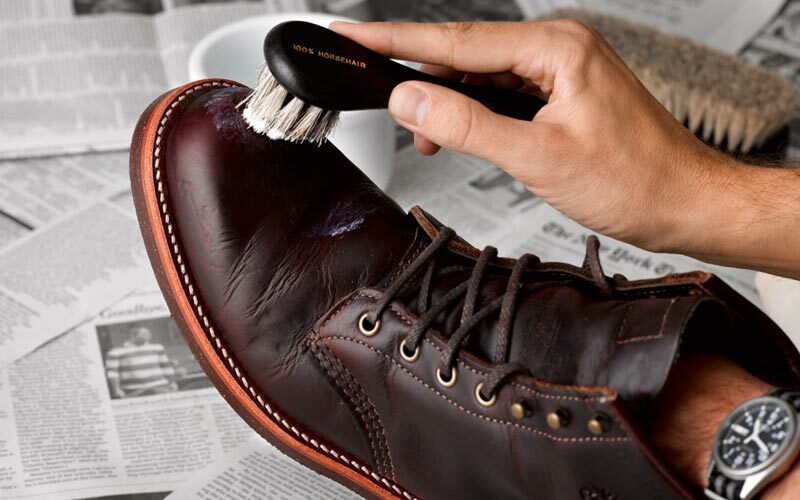 This resulted in a situation wherein men yearned to maintain style while conserving materials and cutting expenses. 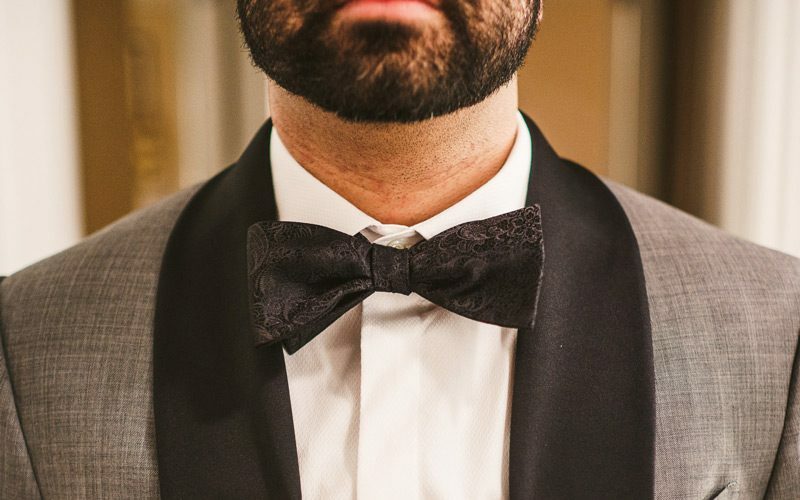 Many consider the 1940s to be the last decade of truly gentlemanly style and elegance (whoever said that hasn’t met the guys here at The GentleManual). With the severity of the war hanging over society, strict fabric rationing and a prevailing demand for practicality over style began to influence the fashion world. Any past flashiness and extravagance in men’s fashion all but disappeared–if you were seen wearing something flashy or expensive, it was considered a diss to patriotism (as all money and fabric needed to be reserved to help those in uniform). 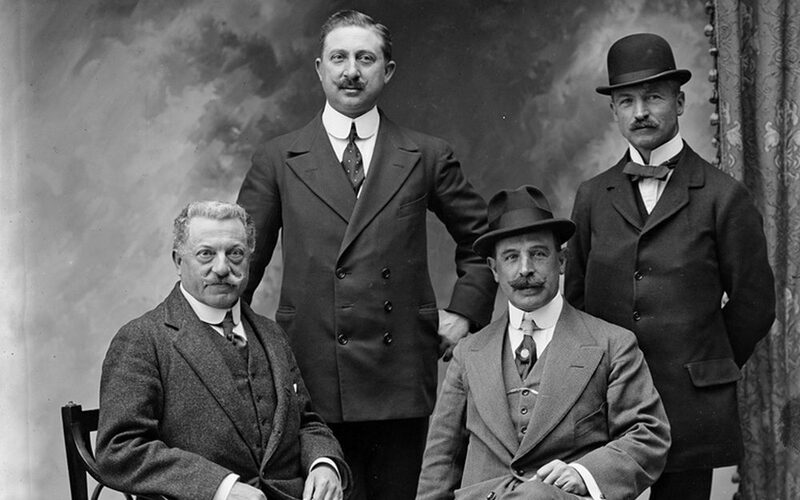 As a result, suits were made without vests, pocket flaps, and trouser cuffs. The men that stayed home, away from battlegrounds, aimed to look as austere as possible, and subsequently adopted a style of simplicity with little (if any) detail. The zoot suit was condemned for its excessive use of fabric, though it was still worn to a lesser degree. After the war, men’s fashion experienced a small revival, but it would never reach the extravagance of the past. Double-breasted jackets returned, as well as wider trousers. 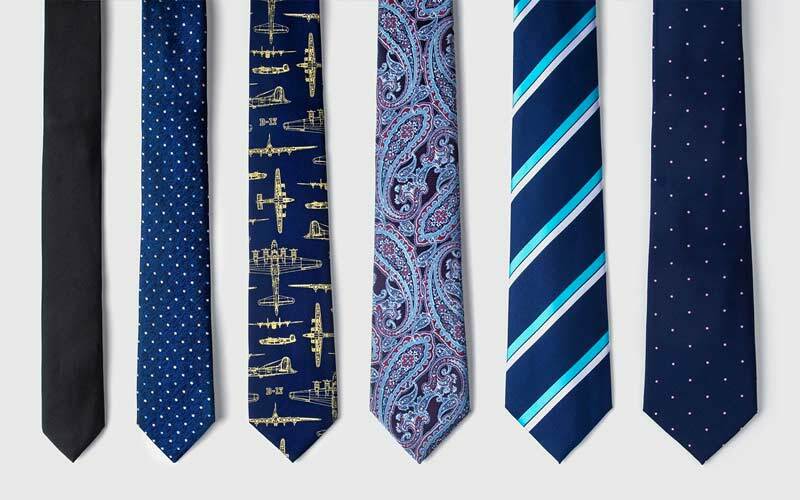 Colors returned, and hand-painted silk ties were all the rage. 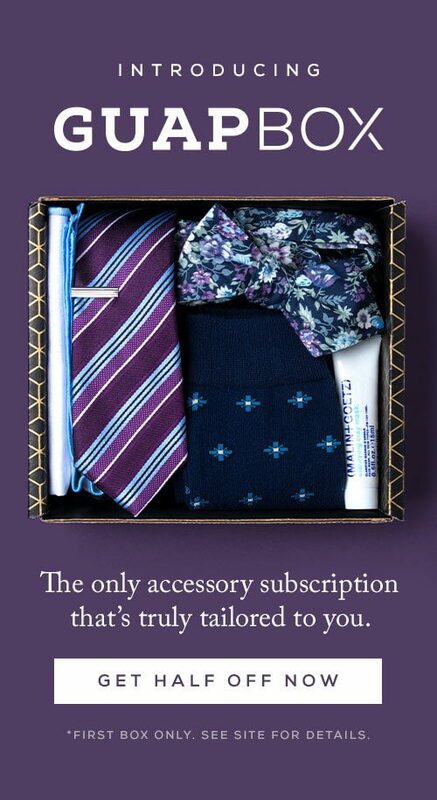 Every man in the 1940s wore a tie as a way of expressing one’s individuality after so many years of not being able to. 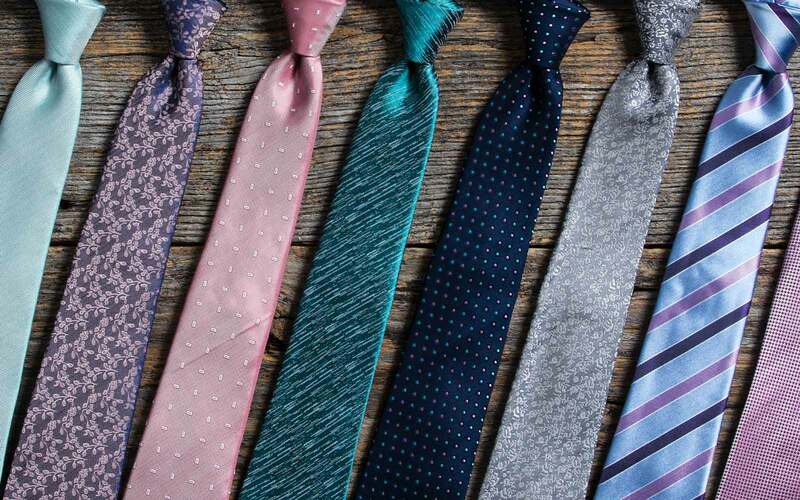 Wider, shorter ties in colorful patterns were a hot item, and men would wear them with decorative tie pins to further convey their style. It can be safely assumed that the period following the war was like a big exhale for society after years of holding its breath–people could relax again, fun was not only allowed but encouraged, and everyone embraced a more leisurely pace. Casual, Hawaiian shirts became a huge menswear trend toward the end of the ’40s, thanks in part to Elvis Presley. The gist: Wartime austerity and fabric rationing set the precedent for practicality above flashiness in men’s fashion. However, men began expressing themselves in the details, in colors, prints, and accessories. At the beginning of the decade, men’s attire was decidedly simple. Most businessmen adhered to a uniform of dark flannel suits, and conformity became ideal once again. Since everyone had returned from the War, a new monicker–”head of the household”–became synonymous with “husband.” The threat of the Cold War loomed over everyone’s heads, and men wanted to look as much like good Americans as possible. Thus, everyone looked alike. 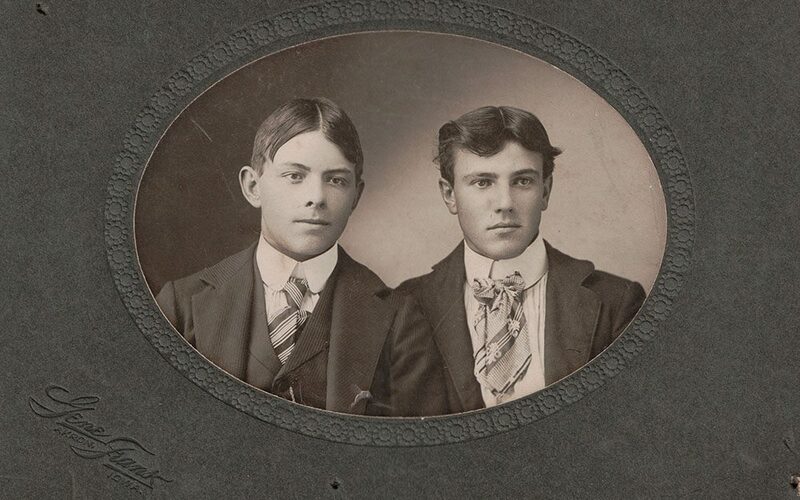 Suits no longer sported shoulder pads (but if they did, they were minimal), ties were slimmer, shirt collars were less pronounced, and the brims of hats were considerably narrower. Trousers, however, remained mostly unchanged. Over time, the 50s became a bit more leisurely. 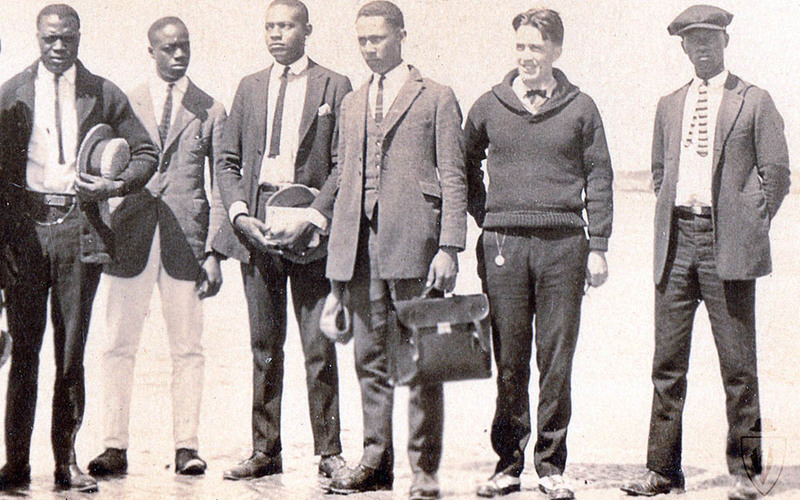 Travel began to boom, as well as an interest in sports. 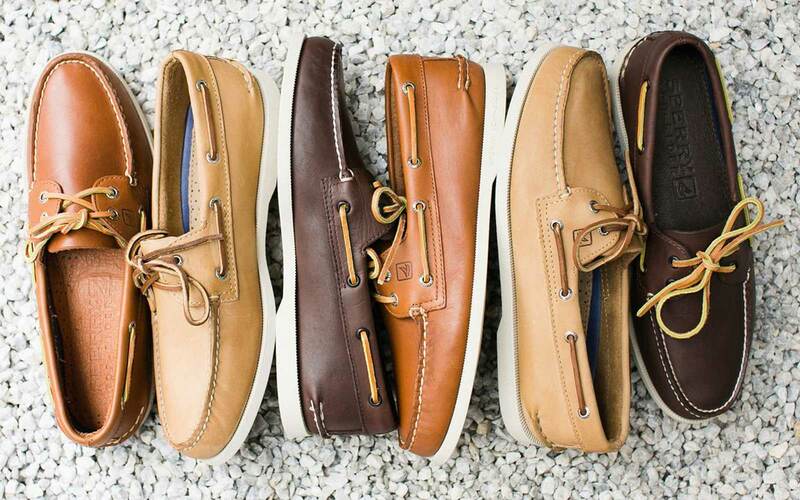 Fashion adapted with these interests, and casual, athletic attire (like the polo shirt) grew in popularity. Short shorts in pastel colors took center stage in men’s casual wear. 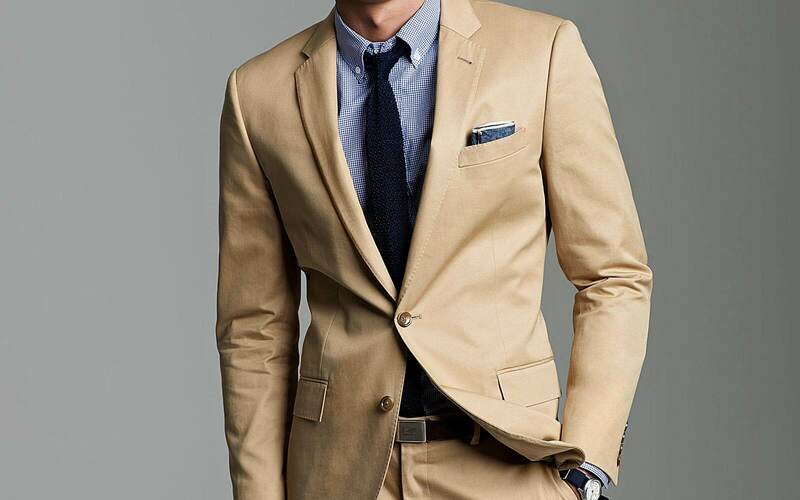 Sports blazers cut in more comfortable shapes and made with lighter materials became a staple of everyday wear. 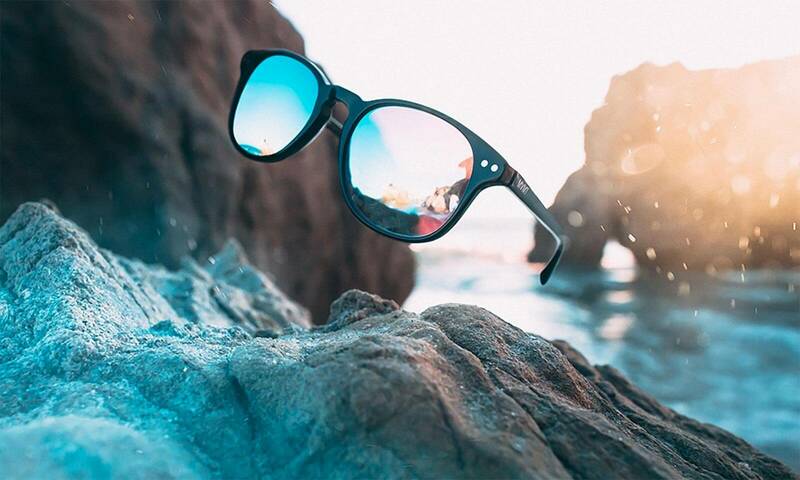 Additionally, sunglasses–which were previously considered a luxury item–became more affordable and thereby grew in popularity. 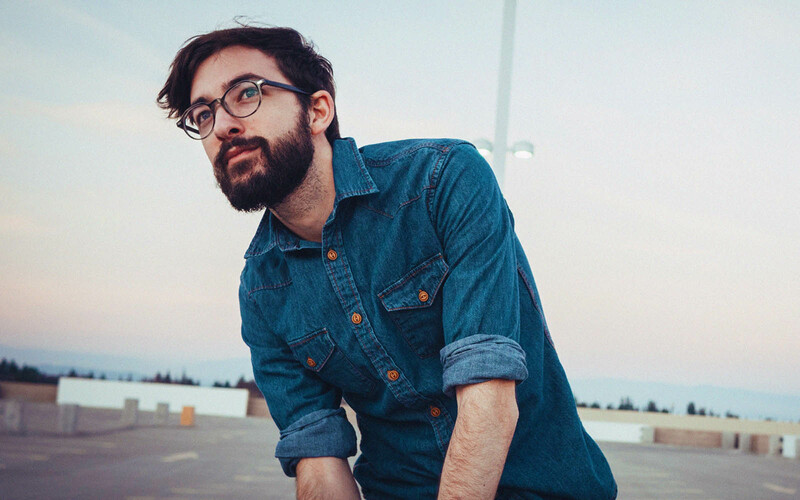 Wayfarer and Clubmaster style glasses were worn by everyone throughout the decade (and they’re still popular today!). For teenagers and young adults, the ’50s were boring. 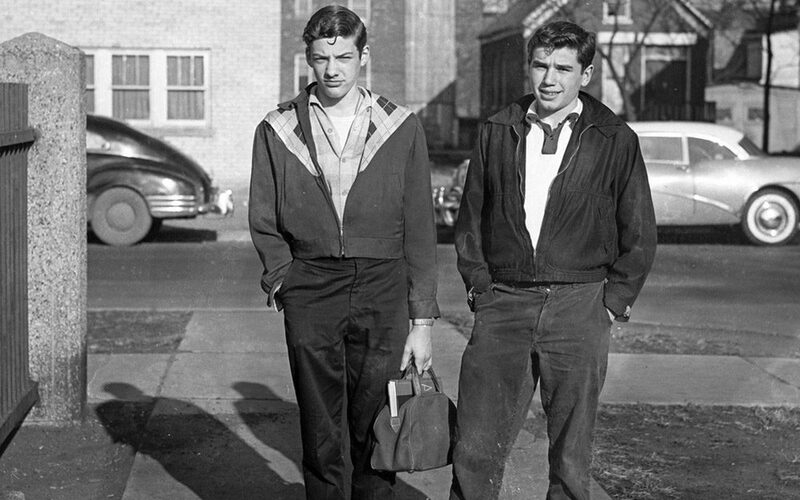 The overall sense of postwar calm that permeated society wasn’t all that stimulating, and so the greaser subculture was born. 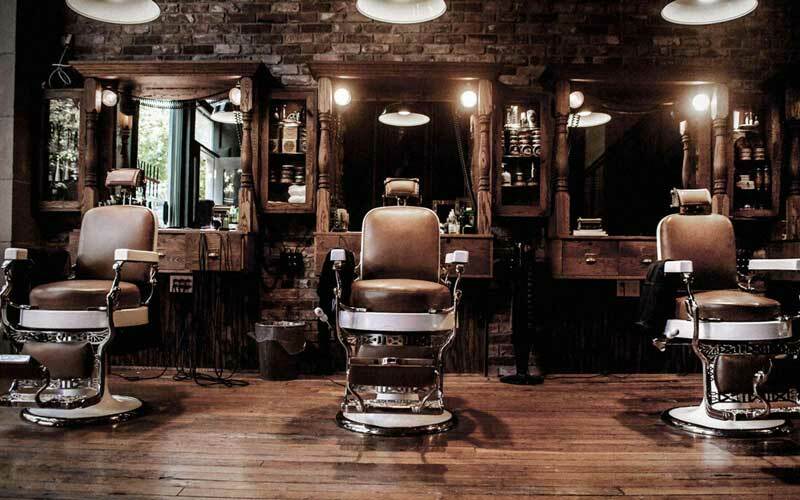 Named after the iconic greased-back hairstyles of rock and roll musicians, greasers were typically working-class youths, hoodlums, and motorcycle gangs. 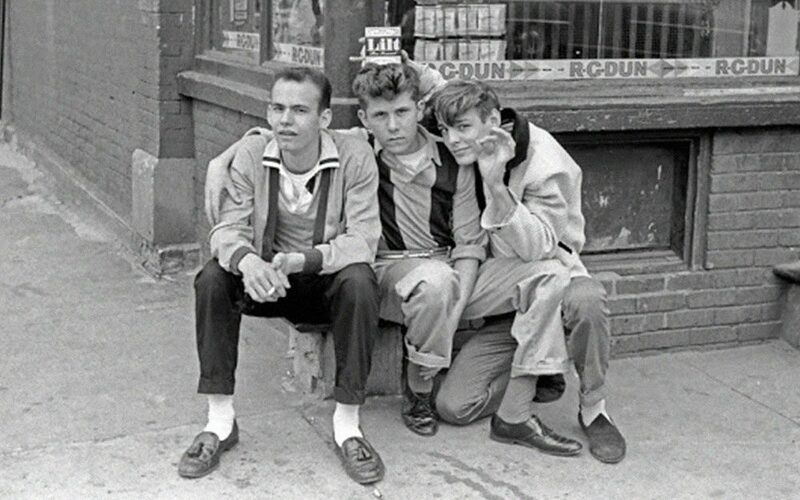 Greasers became a popular subculture both in pop culture and in fashion because of Elvis Presley, Marlon Brando, and James Dean. The standard greaser look consisted of fitted white and black t-shirts, ringer t-shirts, baseball shirts, black or blue rolled-up denim, leather jackets, bomber jackets, and letterman jackets. Teenagers would complete the look with fedoras, motorcycle helmets, vintage leather caps, flat caps, army boots, winklepickers, creepers, and Converse Chuck Taylor All-Stars. 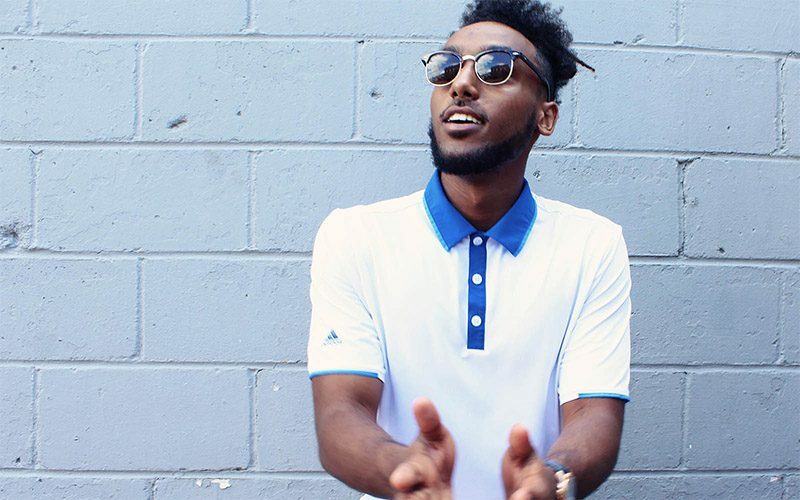 The gist: Sports and leisurely travel grew in popularity, prompting growth in casual attire. 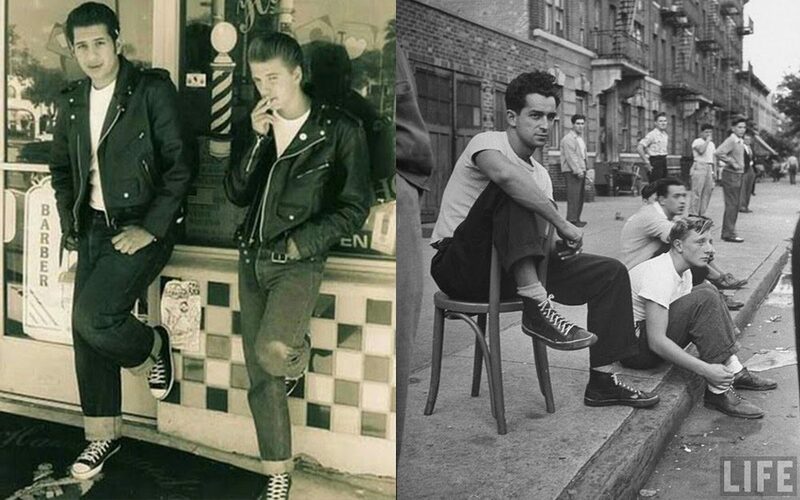 Teenagers broke off from adult fashion for the first time, creating their own greaser subculture. 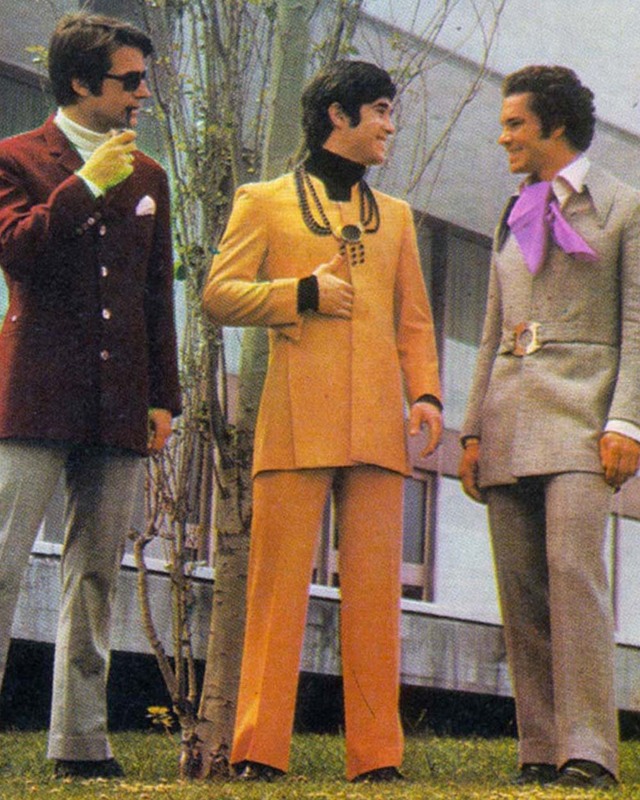 Many consider the ’60s a revolutionary period for men’s fashion. Formality gave way to skinny and flared trousers, flower shirts, wide lapels, and other adventurous trends. Some say that while women’s fashion was becoming decidedly more boxy and masculine, men’s fashion took a more effeminate turn in the ’60s, with longer hair, bright colors, thin silk scarves, paisley prints, velvet pants, puffy sleeves, and men’s jewelry all taking their turn in the fashion spotlight. 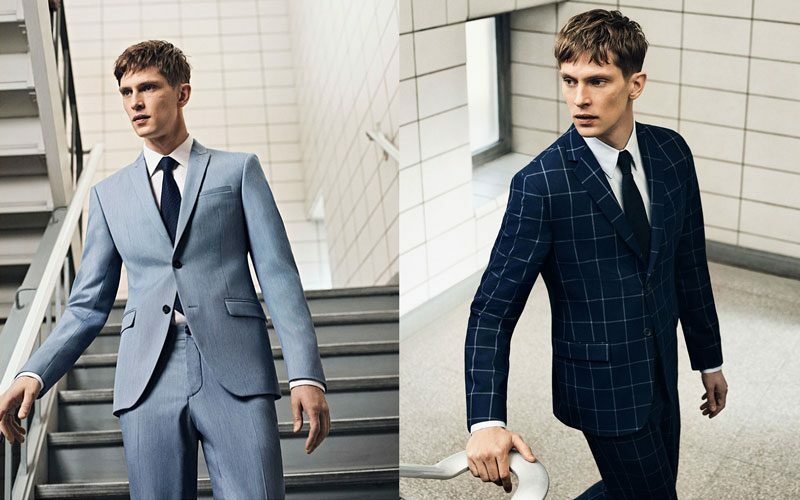 Suits became tighter-fitting, trousers were narrow, and vests were all but a thing of the past. Suits were even often (if one’s job permitted) abandoned in place of army coats and denim jackets. Following the example of the previous decade, the youth continued to branch off and lead when it came to fashion. The ’60s were considered “youth-driven,” with trends set by subcultures: mod, rocker, hippie, etc. and fashion, as a result, was as bold as it was lighthearted. During this time, the British music scene grew in popularity. Any trend that looked like it came from the high streets of London became desirable (think Beatles–pea coats and round sunglasses, anyone?). 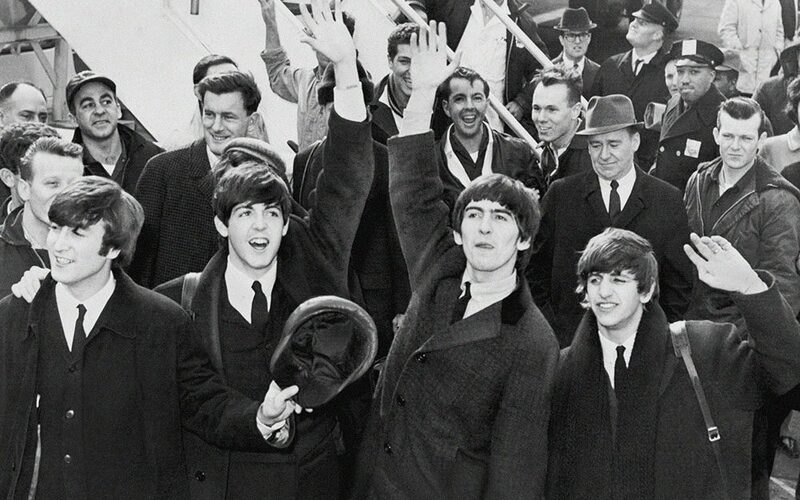 In fact, some say that the Beatles singlehandedly made clean, straight cut business suits a stylish wardrobe essential. From suits and skinny ties, to skin-tight turtlenecks, to their signature haircuts, and everything in between; if the Beatles wore it, it became a ’60s staple. The gist: Youth-driven subcultures dictated ’60s fashion. Trends were highly influenced by the Beatles, and men’s fashion decidedly became more mod and feminine throughout the decade. Some say that fashion from the ’70s came from another planet–and we’d be hard-pressed not to believe them. The ’70s were a crazy time. Styles that would’ve been laughed at just 10 years prior became big. As synthetic fabrics came about, materials dropped in price, and travel and shipping became easier, fast fashion was the name of the game. Casual menswear and the “wash and wear” evolution of men’s clothing became abundant and widely available at extremely low prices. 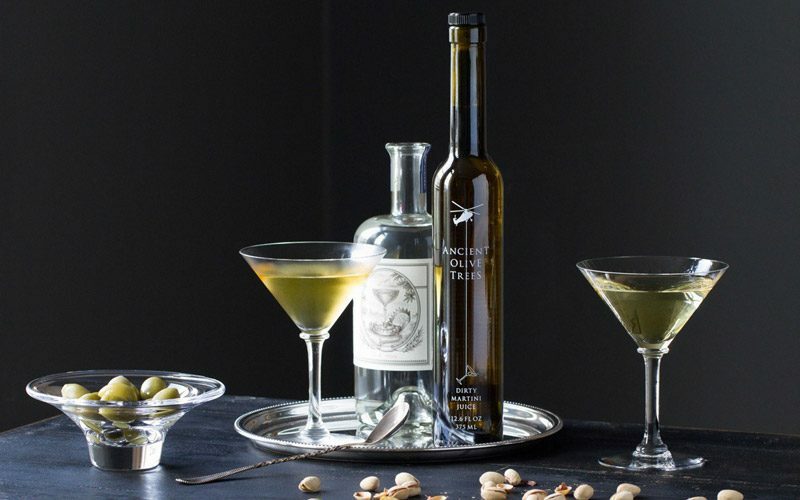 This was a direct reflection of the era’s air of spontaneity and indulgence. 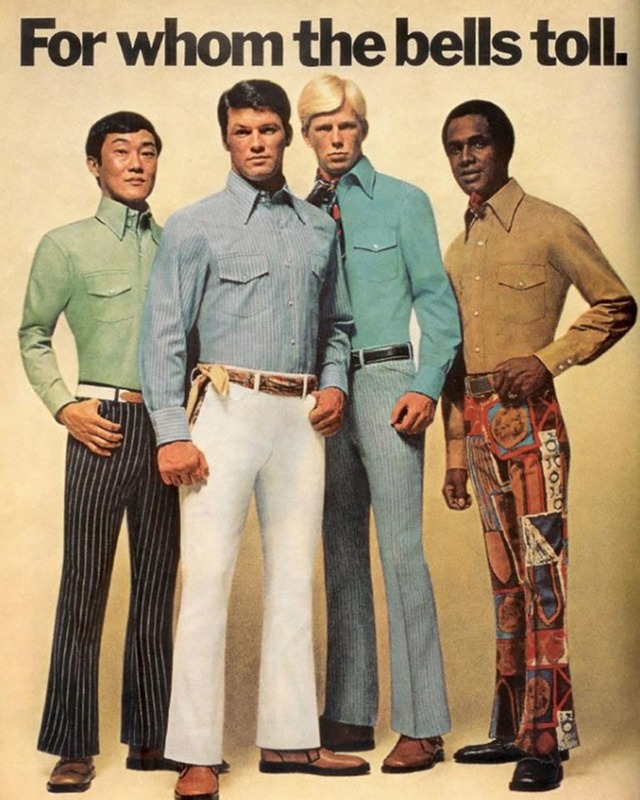 By 1972, platform shoes and bell bottom trousers were menswear staples. Leisure suits and tracksuits were also popular. Bell bottoms were characterized by a high waist, a tight fit through the thighs, and a flare beginning at the knees and extending outward. 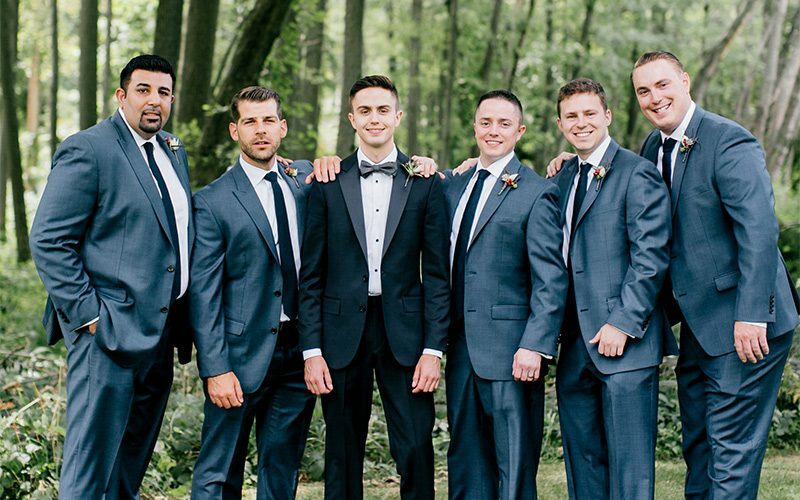 Bell bottoms were paired with suits and wide collar shirts in varying patterns from loud florals to polka dot to checked to plaid and everything in between. Chunky cable knit turtleneck sweaters (often with matching belts or hats) were also all the rage. Three-piece disco suits circa 1977’s hit flick Saturday Night Fever were every man’s dream look. It was undoubtedly a groovy time to be alive. 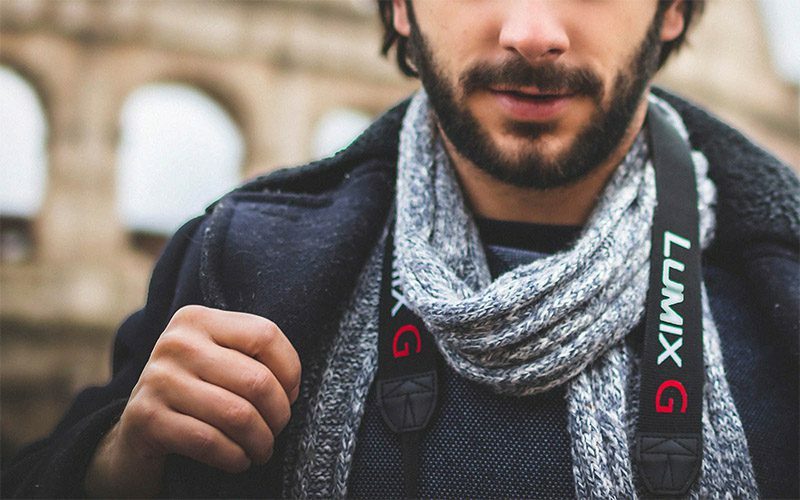 The gist: Increased ease of travel and shipping, coupled with a drop in the cost of synthetic materials, gave rise to the “wash and wear” evolution of men’s fashion. Platform shoes, bell bottoms, leisure suits, and chunky sweaters took the stage in the ’70s. If a man wasn’t wearing sports-inspired duds, he was donning a denim jacket, a long-sleeved velour shirt, and a pair of Levi’s. The economic boom in the ’80s, coupled with a newfound attitude toward success and power dressing, made for a very self-conscious and gluttonous (at least, in terms of materialism and excess) decade. 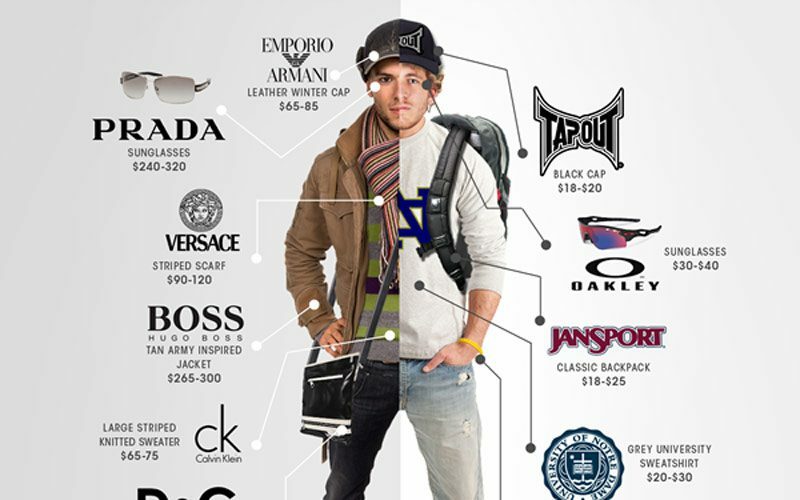 Brands mattered, and “Yuppies” (Young Working Professionals) made casual wear, collegiate attire, and “prep” a significant trend in the ’80s. 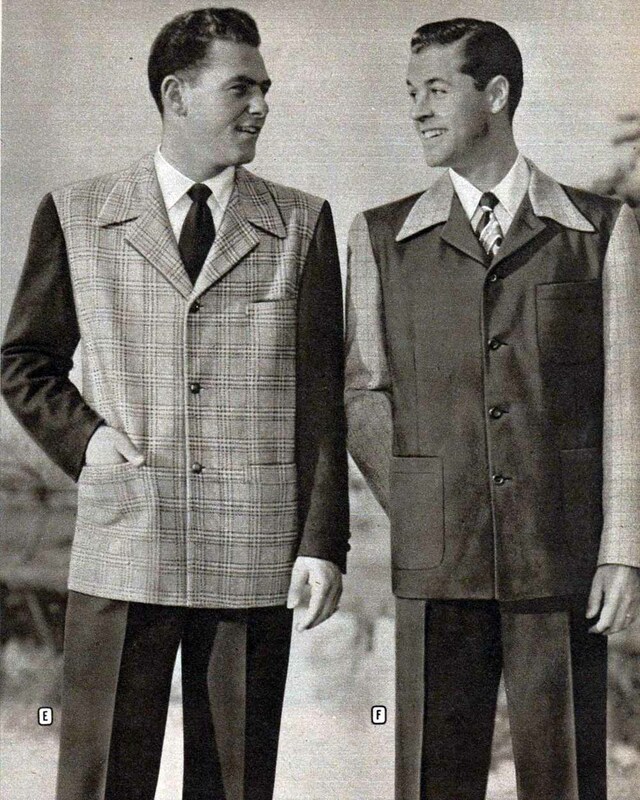 Men’s suits were surprisingly conservative. 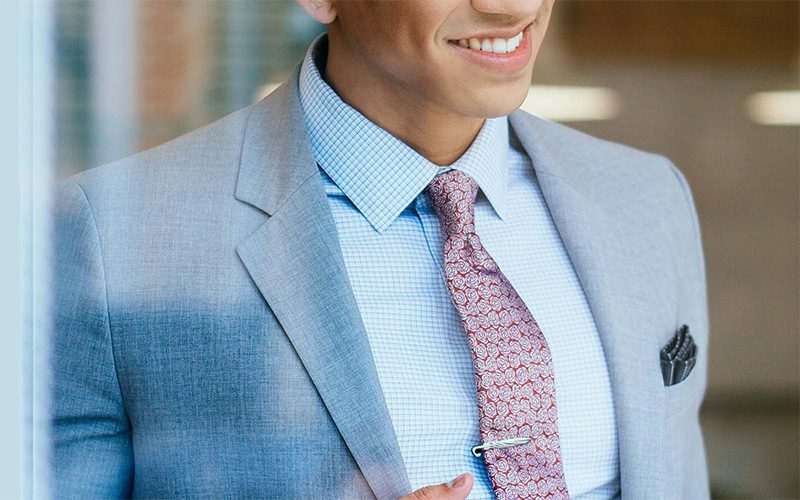 Suits in neutral colors were paired with skinny ties, and knit square-bottomed ties were the “it” thing. When men weren’t working, they would pair graphic-print button-downs with slacks for a go-to ensemble that was appropriate almost anywhere. Other popular pieces in menswear included slouchy, pleated trousers, bomber jackets, preppy plaids, polo shirts, and turtlenecks. 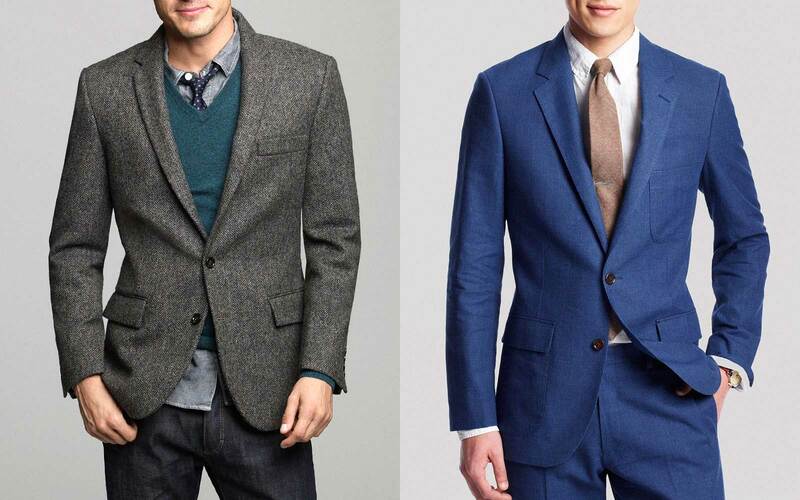 Men’s trousers and blazers began hitting the shelves tapered in the way that they’re often worn today. 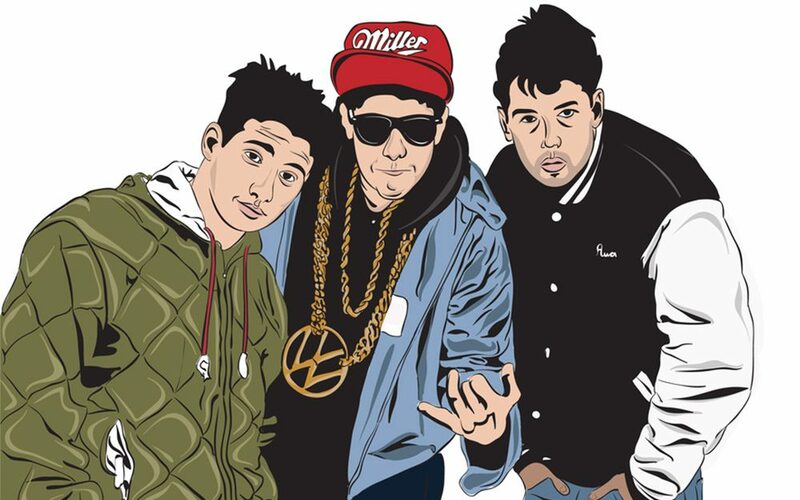 Youth began to embrace hip-hop inspired streetwear and sportswear, influenced by artists like The Beastie Boys and Tupac Shakur. 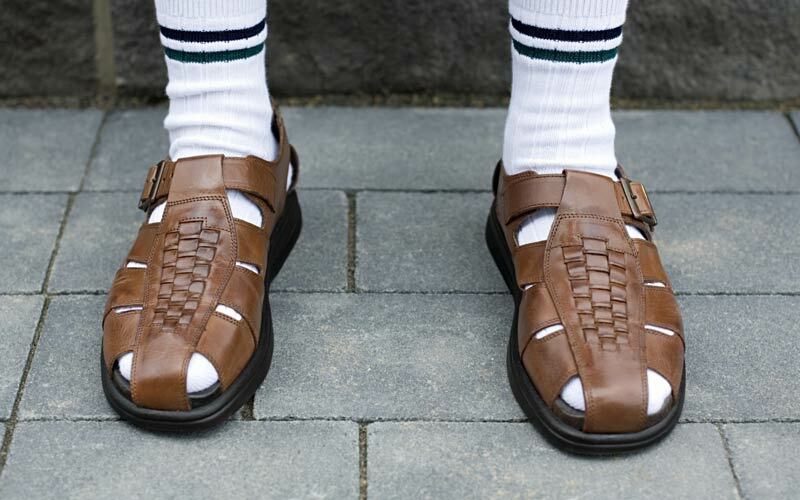 The gist: Since the economy was doing well, men’s fashion took a turn toward excess. Brand names and slouchier fits were all the rage. 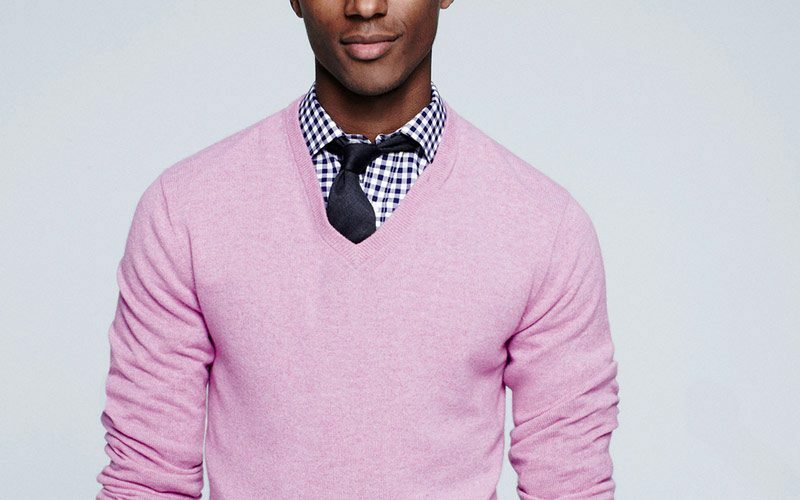 Young Working Professionals made preppy-casual a significant ’80s trend. The 1990s experienced another huge fashion transformation as men basically banished any and all trends from the ’60s, ’70s, and ’80s in attempt to redefine themselves. 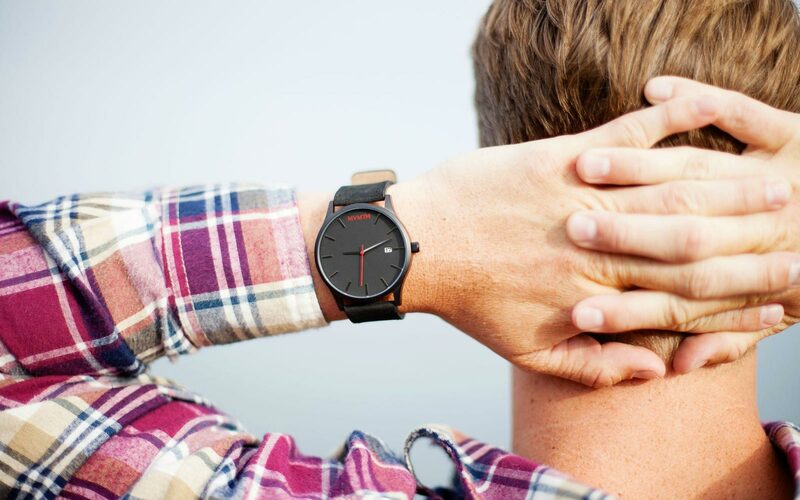 “Casual” was undoubtedly here to stay, and minimalism was the new “in” thing. 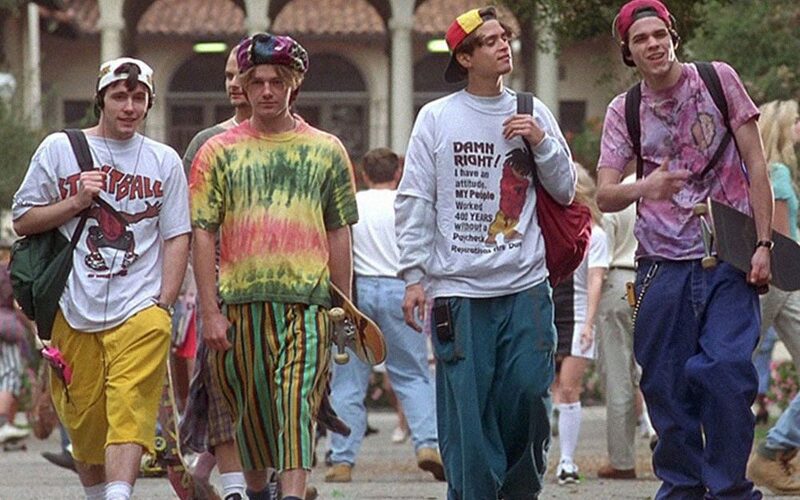 Mainstream fashions were influenced by three significant youth subcultures of the decade: rave, hip-hop, and grunge (a direct diss to the excess and flashiness of the past two decades). 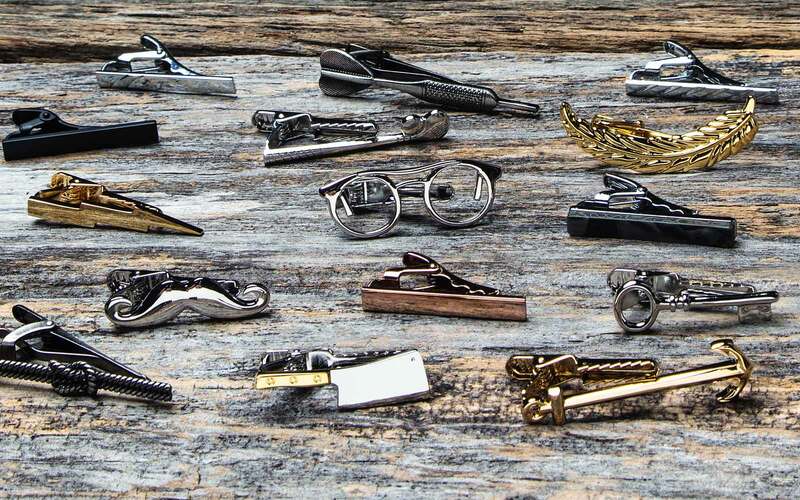 T-shirts, shorts, jeans, trainers, sweatshirts, hoodies, tattoos, piercings, and prominently displayed brands comprised the majority of any man’s closet. In fact, the shift towards a more casual work uniform began thanks to the ’90s and its rejection of stuffiness and formality. The ’70s and the ’80s were all about excess and glamour. By the ’90s, however, an era of casual, relaxed clothing in simpler colors and cuts replaced that influence. Leather jackets, knit sweaters, flannel button-downs, bowling-inspired button-downs, baggy denim jeans, overalls (especially with one strap down–thanks, Will Smith), baseball caps, jorts (jean shorts), manpris (man + capris… not quite shorts, not quite pants. 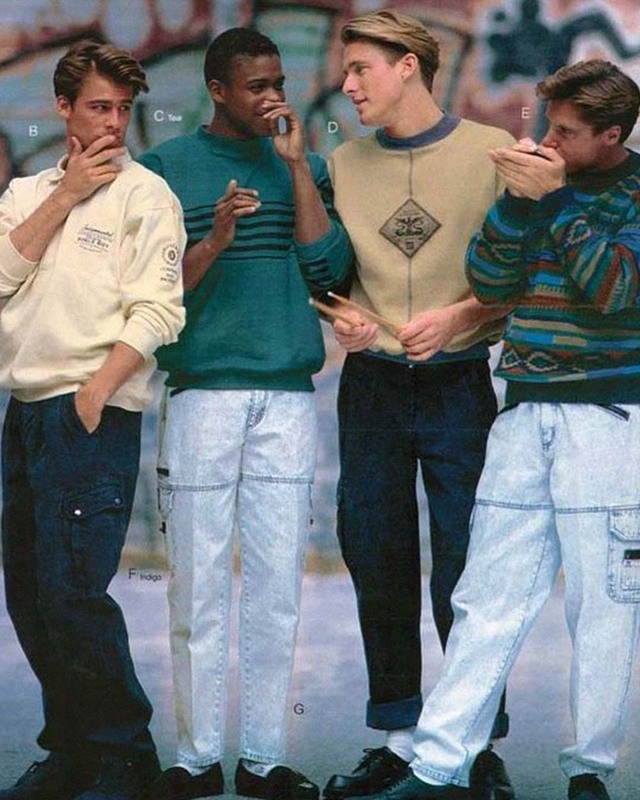 Yeah, that happened), parachute pants, sporty sneakers, and graphic t-shirts were 90’s staples. 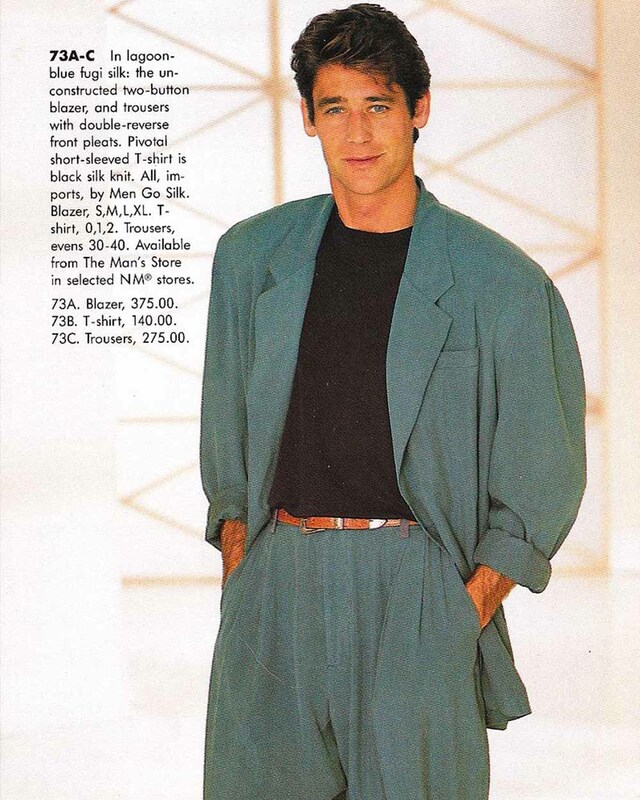 Oh, and saggy boxer-baring pants were also big in the ’90s… where they should stay. The gist: The ’90s was about rejecting previous decades’ trends, and as a result, the decade championed casual clothing influenced by grunge, hip-hop, and rave subcultures. The early 2000s saw the climb of fast fashion. With globalization, and the ability to cut costs through outsourcing, brands such as H&M and Forever 21 were able to mimic runway looks at a fraction of the cost. This resulted in the collapse of class structures defined by fashion. High and low trends were mixed, and as clothing became cheap, everyone was able to save up for designer accessories. At the turn of the millennium, men’s fashion experienced a brief “futuristic” wave. Black, silver, and metallic were in. Men wore leather outfits, puffy jackets, tracksuits, and Rockport boots. In the mid-2000s, styles sobered as the US entered war. Distressed denim became popular, along with military wear as everyday clothes. Popular colors included beige, rust, and forest green, and men wore low-rise jeans, light-colored polos, cargo pants, khakis, and short sleeved button-downs. 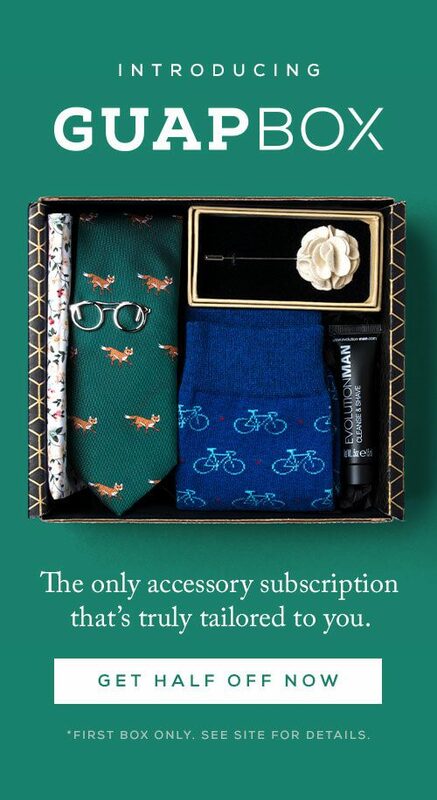 Accessories such as white belts, aviators, trucker hats, flip-flops, Argyle print, and oxford shoes were also in. 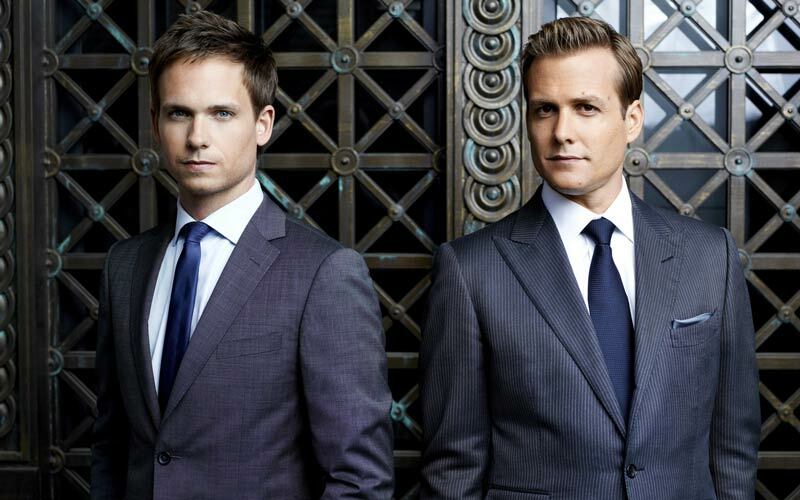 Suits became slimmer, and popular styles included black, navy, charcoal, and pinstripes. Nehru suits and Mandarin collars, inspired by James Bond and the Matrix, began to emerge. Men favored the smart casual look with flat front chinos, beige cardigans, Argyll pullovers, and houndstooth sports coats. Youth fashion was inspired by hip-hop and skater culture, mixing sportswear with high fashion. Sneakers, from Chuck Taylors to Nike Air Jordans, became hot items. At the same time, goth and indie pop subcultures developed. People became interested in vintage thrift store shopping and adopting a darker, rocker aesthetic–a twist on British mod. The gist: People embraced casual fast fashion trends for clothing, and they spent and focused more on the accessories, such as footwear and sunglasses. The early 2010s experienced a revival of ’20s prep style, along with an exponential rise in fast fashion and globalization. Smart casual looks, athleisure, along with hipster fashions were on trend. 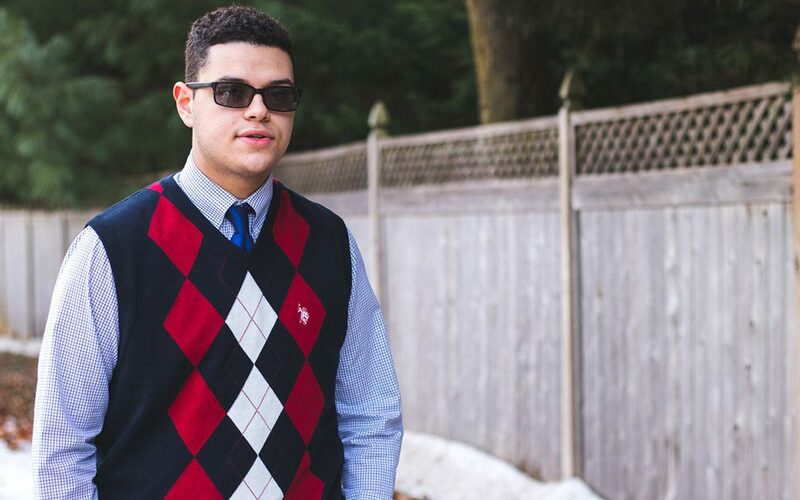 Does everyone remember the fedoras, non-prescription glasses, and rave bracelets of the recent past? These items seemed to signal our joint enlightenment as the human race. One love, y’all. From dressing for propriety to dressing to express yourself (even if expressing yourself meant throwing on a pair of jorts), we’ve certainly come a long way. In 100 years, we have changed the game when it comes to fashion many, many times. Menswear has been influenced by music, war, the economy, women’s fashion, cars, gangs, celebrities, sports, and so much more since before you were even born. Think about that the next time you put on a fedora or a tie!